Blocks of red, yellow, blue and white from the last iteration have been painted over with brighter hues. 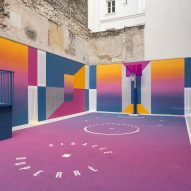 The rubber court surface blends from blue at the ends to pink in the centre, while gradients have also been applied to the surrounding walls. Backboards made from translucent pink plastic were added, while the playing area and zones are marked out in white. "Through this new court, we wish to explore the relationship between sport, art and culture and its emergence as a powerful socio-cultural indicator of a period in time," said the team. 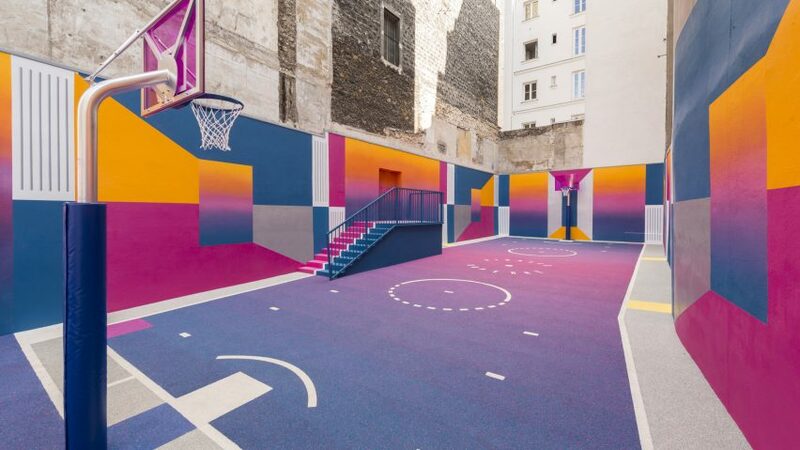 The slither of urban space between two historic residential blocks sits opposite the Pigalle Basketball store, and was first renovated by the brand's founder Stephane Ashpool and Nike in 2009. As part of the latest update, the white barrier concealing it from Rue Duperré has been replaced with a lower wall and panels of blue mesh, so passers-by can now peer inside. "The anatomy of the human body as well as its performances have had a lifelong relationship with art," the team said. "Since the legacy of Greek and Roman antiquity, sport is represented as a dominant idea within the beauty of an era." "This never-ending quest for modernity has forged a strong bond between functionality and aesthetics over the decades," it continued. Ill-Studio was founded in 2007 by Thomas Subreville and Léonard Vernhet. 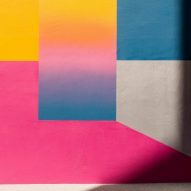 The company works across design, films, photography, fashion, installation and print for clients including Louis Vuitton, Supreme and The New York Times. Pigalle's first store opened in 2008 and is named after the area where Ashpool grew up. The two companies have continually collaborated since sharing an office a decade ago. 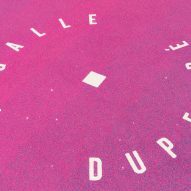 Ill-Studio designed Pigalle's logo and visual identity, and has worked on a variety of art-focused projects for the brand. 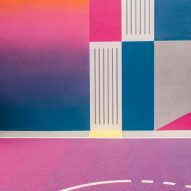 Nike has previously created a basketball court in Shanghai with motion-tracking and reactive LED visualisation technology built into the floor. The US sports giant also enlisted artist Kaws to paint his signature motifs across two courts in New York City. Photography is by Sebastien Michelini.